Berlin-based artist Amalie Jakobsen’s show is an exacting homage to artist El Lissitzky’s “Proun Room” of 1923. 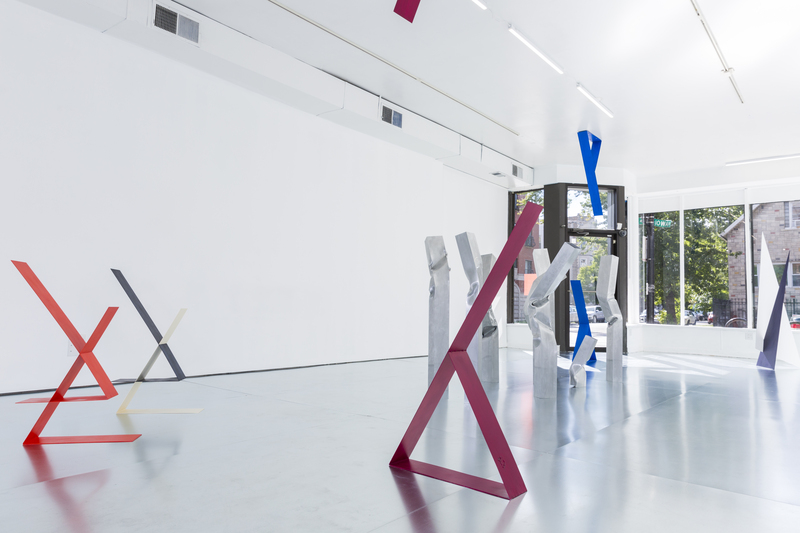 Through sculpture and installation, Jakobsen revisits an old song with new choreography. Eight hollow aluminum pillars clustered in the middle of the space serve as the focal point of this exhibition. Seemingly crushed by Herculean hands, they bend and twist, denying the nature of their material. Covered in galvanized zinc, the gallery’s floor and dividing wall abstractly mirror Jakobsen’s sculpture for an effect that extends past any perceived individuality in the works. Pairs of contrasting geometric steel pieces flank either side of the aluminum sculptures. Hung symmetrically from the ceiling to mirror their standing counterparts, these blue and red duos create an increasingly fragmented movement in the room. 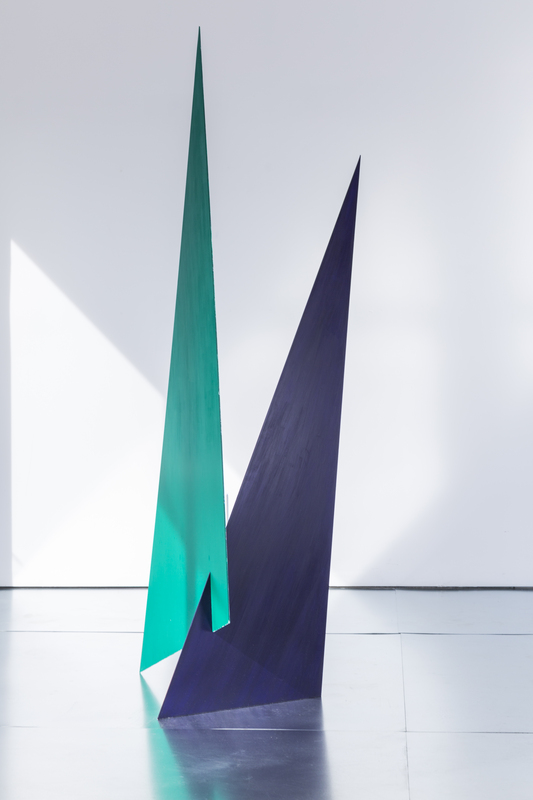 Additionally, to resist the trappings of “objecthood,” Jakobsen applies paint—forty to sixty layers each—over these and the other angular sculptures to give them their color as well as their destabilized status as sculpture. Jakobsen lithely avoids the polemics between the theatricality of the literalist object and the pictorial of the modernist object in favor of form, color and movement. The visibly painted strokes on the pieces work to move past the more familiar confrontational stance of the minimalist sculpture, and instead reintroduce theories of painting for a well-blended effect on the beholder. A single wall piece hangs behind the dividing wall. A variation on the grouped aluminum works, this work resembles a musical eighth note. Ironically the only piece the viewer cannot encircle in their inspection, this work most closely resembles the Lissitzky objects from his “Proun Room.” The two ends, also molded to bend and resist rigidity, peel themselves off the wall to demand a presence and the anticipation of continued movement.